2017 Lowe Infinity 250 RFL Meet Infinity, the head-turning pontoon series from Lowe that raises the bar for comfort, style and luxury. Plush upholstery, beautiful fit & finish, superior ergonomics and premium performance combine to elevate the pontooning experience. Twin rear-facing lounges encourage total relaxation and prime water views. Backed by Lowe Boats award-winning customer service, your Infinity experience will be excellent all the way. Please note: This boat model may or may not be in-stock. A Nationally Advertised Price, if listed, may change without notice or include accessories not fully described herein. Please contact your local, authorized dealer for exact details on model availability and package pricing. 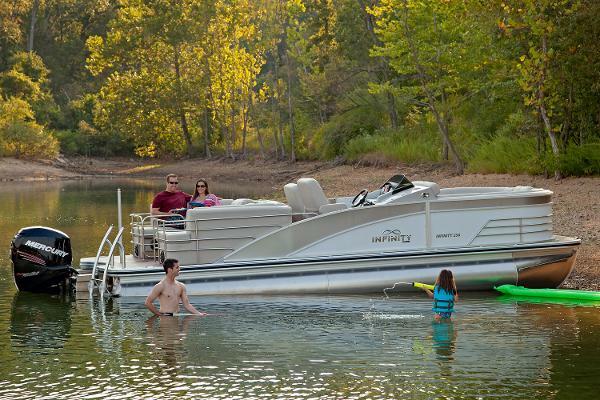 2016 Lowe Infinity 250 RFL Meet Infinity, the head-turning pontoon series from Lowe that raises the bar for comfort, style and luxury. Plush upholstery, beautiful fit & finish, superior ergonomics and premium performance combine to elevate the pontooning experience. Twin rear-facing lounges encourage total relaxation and prime water views. Backed by Lowe Boats’ award-winning customer service, your Infinity experience will be excellent all the way. Please note: This boat model may or may not be in-stock. A Nationally Advertised Price, if listed, may change without notice or include accessories not fully described herein. Please contact your local, authorized dealer for exact details on model availability and package pricing. 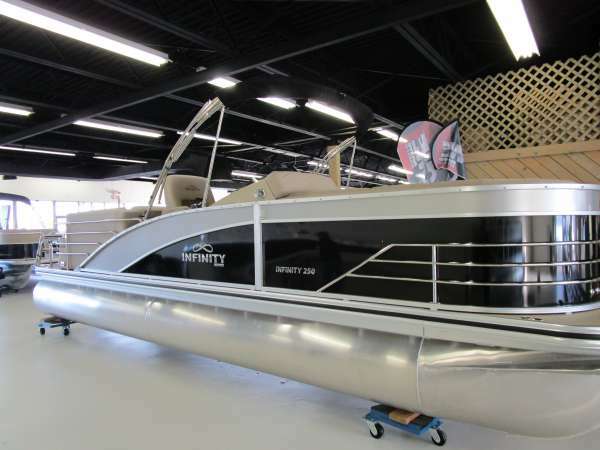 2015 Lowe Infinity 250 RFL This boat model may or may not be in-stock. 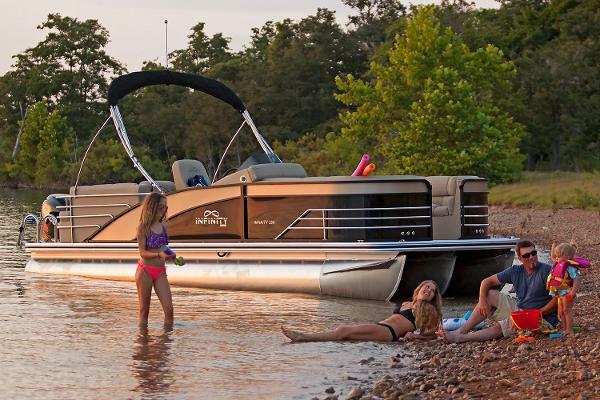 Please contact your local, authorized dealer for more information Meet Infinity, the new pontoon series from Lowe that raises the bar for comfort and luxury. Plush upholstery, stylish finishes, beautiful ergonomics and premium performance combine to elevate the pontooning experience. Twin rear-facing lounges encourage total relaxation and prime water views. Features include:25" diameter high-buoyancy pontoon logs w/ 16” cross chambers and full keelCapacity for 13 passengers to ride in comfortRaised fiberglass console w/ chrome bezel tach, volt, speed & fuel gauges3 LED lighted cupholdersPolk® PA450 stereo w/ Bluetooth, SiriusXM™ & speakersDual rear-facing loungers w/ armrestsPortside extra-wide reclining helm seat w/ swivel & sliderCustom Plexiglas table w/ drink holdersColeman® stainless-steel coolerPop-up privacy enclosure28-oz. marine carpetConvenience center w/ slide-out trash binAft entry w/ heavy-duty 4-step boarding ladderHeavy-duty 10’ Bimini top w/ boot & quick disconnects Lowe factory packaged boats are available with various horsepower Mercury® outboards. Standard equipment and options may vary from model to model.